Note: In eRA Commons, there is no feature to email your password to you if you forget it. If you have forgotten your password, you will need to reset it. To do this, click the Forgot Password/Unlock Account? link below the Login button. Progress on NIH funded grants is now reported via the Research Performance Program Report (RPPR). The RPPR has or will replace all reports previously submitted via the eSNAP system. 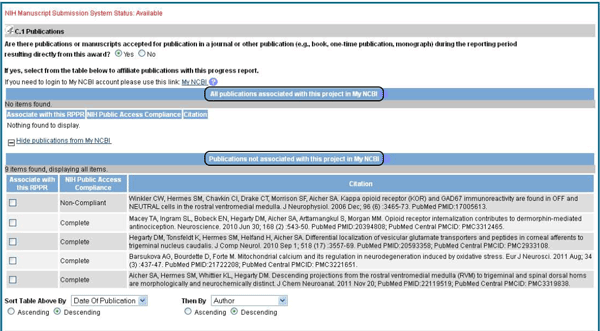 The RPPR connects with the my NCBI system and the my Bibliography to provide provide all the publications which are available to be selected for each report. Section C of the RPPR relates to publications. All the publications from the my NCBI my Bibliography associated with the eRA Commons username used to access the RPPR will be available to be associated with the report in the lower box. Publications are selected by checking the box under "Associate with this RPPR". Publications are moved to the upper box when the information in the page is saved, usually by navigating to another Section of the RPPR. If publications are missing, they need to be added to the my Bibliography associated with the eRA Commons account. To ensure no delays in grant processing and funding, all publications must be public access policy compliant at the time the report is submitted. The NIH does allow a small grace period to allow non compliant publications to be made compliant but this may still result in delays in processing or funding. If you are just becoming familiar with eRA Commons, you might want to practice a few things in a demo account before doing them in your actual account. See this page for information on how to set up an eRA Commons demo account. 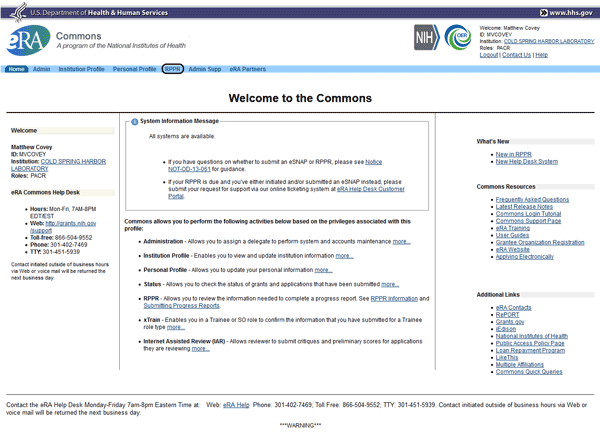 See the Further Resources page for links to user guides, help desks, and other sources of help with eRA Commons.